25mm Diameter Round Brass Head. Wax sticks for you to use. Presentation wax impression enclosed in black plastic case. Supplied in a black velvet draw-string carry bag as standard. DESIGN FROM OUR WEBSITE (Popular, Masonic, Military - Please use website description: We will confirm this with you - Help? FAMILY ARMS RANGE Arms Of: - Help? Include Family Name or Motto: - Help? Style of Arms: - Help? CREST If known, please describe your crest: We will confirm this with you - Help? CLAN Enter Clan Name: We will confirm this with you - Help? MONOGRAM Enter Your Monogram Initials: - Help? Extra Wax Impressions: + EXTRA Cost - Help? Following submission your requirements will be scrutinised by an experienced member of the Dexter team. They may ask you additional questions or clarify any outstanding details. You will receive ‘confirmation of order’ normally within 24 hrs. - No funds will be taken until you have approved this confirmation. 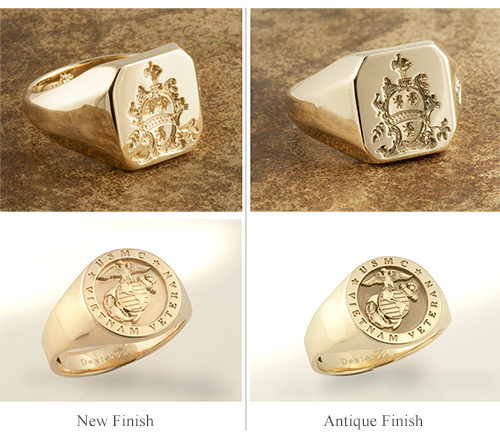 We offer a full money back guarantee if you are not completely satisfied with your finished signet ring. We ask the ring is returned to us within 28 days in an un-worn condition. This guarantee does not affect your statutory rights. All prices are fully inclusive of insured delivery and US import duties or UK / Euro VAT. The purchase area of our website is secured by Norton Symantec, the largest, most recognised company dealing with online security in the world. All your information is transferred, fully encrypted, using the latest most advanced technology. All information we receive will be treated in the strictest confidence and will not be passed on to any third party. Currency dependant on delivery destination - If not in US, UK, Euro: we will advise you of adjusted amount and will NOT process the order unless you have approved. All prices inclusive: insured delivery and US duties or UK / Euro VAT. 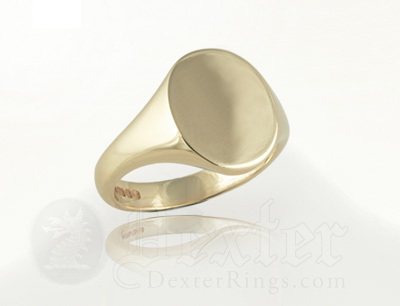 Ladies slim or 'scalloped' shoulder option - available on any ring for those that prefer a more delicate shoulder. Our office team will contact you personally, by email, to confirm your chosen design. Our office team will contact you personally, by email, to confirm your Arms. You will be shown a picture. If you would like us to suggest arms, please enter any details here that may assist us. No funds will be taken until Coat of Arms is agreed + You will be shown artwork prior to engraving. If you already have an image, please as an attachment & submit this form. The RIBBON traditionally would have contained the family motto. Its style and form are decorative & it is not heraldically significant. It is a popularisation to include the name. It can be included in your design or not, depending on space available and personal preference. Areas in black are purely decoration and bare no heraldic significance. This is what we refer to as a coat of arms style, and will change through history, taste, or on what the arms was depicted. Simply choose a style you like, or something similar to what you may have. 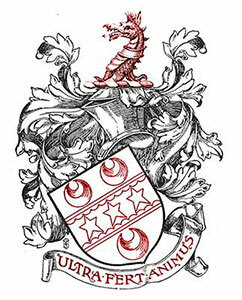 Your key heraldic details, shield crest motto or name (depicted in red) will be un-changed. You can choose different heraldic elements for additional cost – send us an image for a bespoke quote. 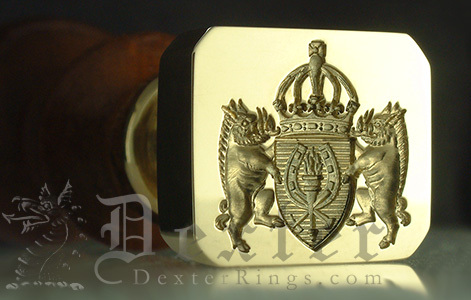 However decorative elements of a ‘bespoke’ arms will usually need to be modified to fit on a ring. Our office team will contact you personally, by email, to confirm your chosen crest. You will be shown a picture. If you would like us to suggest designs, please enter any details here that may assist us. Belt & Garter - Popular choice for the clan badge. Directly into Ring - Omitting the belt or ribbon allows more space for the crest itself. 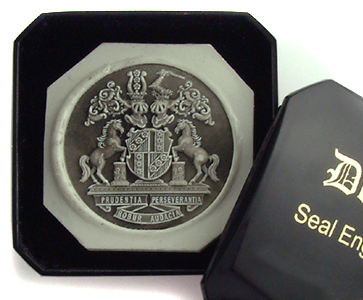 'TRADITIONAL SEAL' ENGRAVING: Deep engraved in-reverse (e.g. 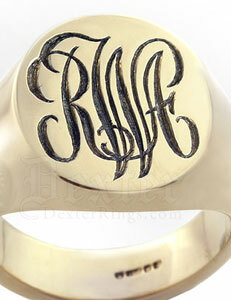 monogram would appear 'back to front'). 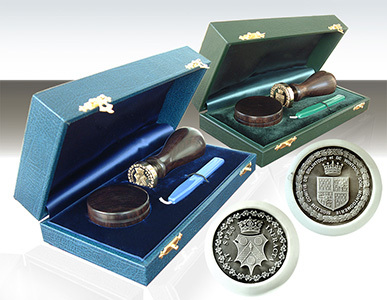 Engraved to create wax seals in the ancient tradition. 'DEEP FOR SHOW' ENGRAVING: Deep engraved un-reversed (e.g. 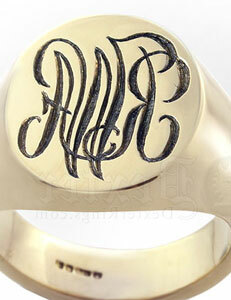 monogram would be read correctly). Wax impression not supplied as standard. New Finish The brighter visual effect of a new engraving will start to age straight away and continue over a period of weeks and months. Natural ageing produces a better, more defined appearance over time. We recommend ‘New Finish’. Antique Finish This is an artificial finish, or patina, that gives the engraved detail contrast similar to the effect of a naturally aged engraving. Each commission is hand crafted and unique, as such this effect will vary. 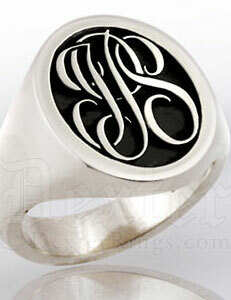 Smaller gemstones can be set into your engraving or larger stones on the shoulders of your signet ring. While the above price guide represents the smaller stones available, larger gems will need to be quoted for. So if bling is your thing please let us know! Gemstone setting could add 2 weeks to your lead time. 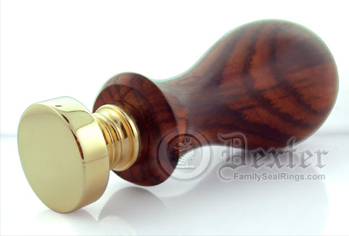 Choose handle in either Rosewood or Oak. The head can be larger or smaller and any shape you like. 25mm Diameter Round Brass Head is supplied as standard however, and provides OPTIMUM performance. Large enough to accommodate any design and the resulting wax impression is clear and impressive. Importantly 25mm remains relatively easy to use. Larger heads are more difficult to create a wax impression. Smaller heads will provide less visually impressive detail. 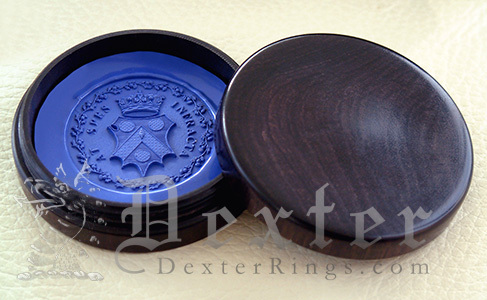 This hand turned case is available for the presentation wax seal that is supplied with your desk seal. It is available in Rosewood only. This bespoke hand made case is available for your desk seal, its presetation wax impression (including Rosewood Turned Case), and wax stick. Each supplied in its own presentation box. Additional presentation wax impressions are only available with this order. 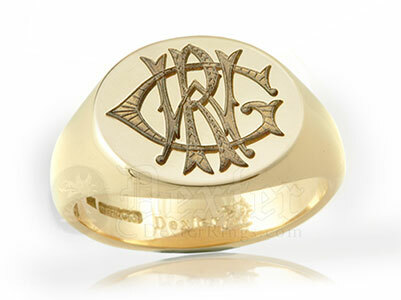 If your ring is TRADITIONAL SEAL ENGRAVED you will receive 1 wax impression FREE of charge. 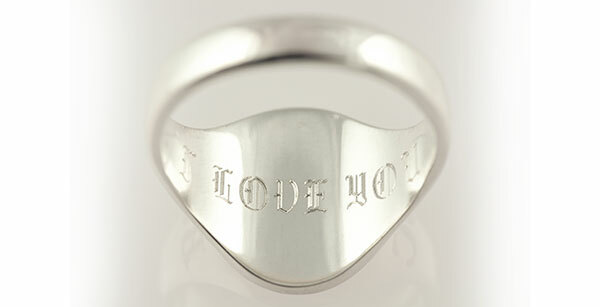 If your ring is DEEP FOR SHOW any impressions you order will APPEAR IN REVERSE. 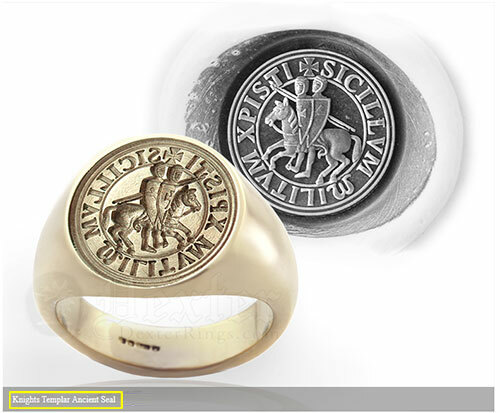 ELEVATED ENGRAVING is NOT suitable for creating a wax seal. It is possible to enamel simple bold block shapes, sometimes it is possible to use more than one colour. Enamelling could add 2 weeks to your lead time.